A novel, disease-modifying Alzheimer’s disease therapeutic, designed by KalGene Pharmaceuticals, could be the breakthrough sought by both patients and clinicians. KalGene, a private, Canadian company, has to date received direct venture investment and grants from leading neuroscience foundations for its amyloid-β- binding fusion protein therapeutic KG1c. KG1c has shown proof of principle in Alzheimer’s disease animal models and is now nearing clinical trials. It is estimated that 5.5 million Americans suffer from Alzheimer’s disease1, experiencing irreversible brain degeneration that causes loss of memory and cognition. By 2050, demographics predict around 14 million Americans could have the disease. Currently only five drugs are approved by the US Food and Drug Administration for the symptoms, not the cause of Alzheimer’s disease. The last approval for a symptomatic drug was 15 years ago and recently there have been a few well-publicized Alzheimer’s disease drug failures. Currently there are no disease-modifying drugs at approval stage. With such an unmet need, KalGene President and CSO Nathan Yoganathan initiated KalGene’s Alzheimer’s disease program to find a disease-modifying molecule that would learn from previous clinical disappointments. He realized this would require the combination of a molecule that targets and removes the toxic form of oligomeric amyloid-β42 and a means of delivering it to the brain through the blood–brain barrier (BBB). This was achieved by licensing a prototypic therapeutic molecule—the amyloid-β-binding peptide, KAL-ABP, which selectively targets the neurotoxic, oligomeric form of amyloid-β—and the BBB-penetrant technology from the NRC. “KalGene was instrumental in putting the amyloid-binding peptides and the BBB technology together and engineered the molecule to have long half-life and excellent brain penetration,” explained Yoganathan. The company has now completed two further animal studies in transgenic mice and aged dogs that have shown the drug to be very effective in reducing levels of amyloid-β in the brain and cerebrospinal fluid (Fig. 1). The company has transferred a successful process to its good manufacturing practice (GMP) biomanufacturing partner and KG1c is in formal preclinical studies. Fig. 1 | PET scan image of amyloid-β load in rat brain using an amyloid-β-specific probe. BBB-enabled peptide therapeutic reduces the brain amyloid-β load in a rat model of Alzheimer’s disease. 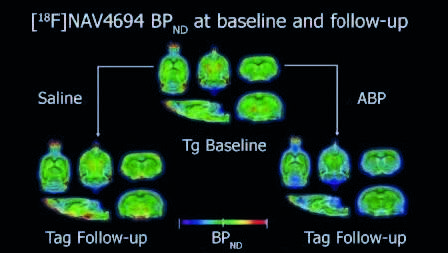 BBB, blood–brain barrier; PET, positron emission tomography. The drug is designed to be taken early in the dis- ease course and KalGene is working with academic groups to select appropriate patients. “We expect to start our phase 1a clinical trial in 2019, at the Montreal Neurological Institute of McGill University. Based upon our experience with the drug in our translational models, we are encouraged to introduce this promising agent to patients,” said Pedro Rosa-Neto, principal investigator for the study from the Douglas Hospital University Research Centre. KalGene has worked closely with the McGill Centre for Aging over the past 2 years to characterize the molecule in a battery of tests resembling the proposed clinical study. Rosa-Neto is the associate director at the Centre for Aging, and will also oversee the clinical trial. “We have had contributions from Canada’s leading brain research foundations (including), Weston Brain Foundation, Ontario Brain Institute, Brain Canada and CQDM so we understand the workings of this molecule so well now. We have seen success in all the studies to date and we are now actively recruiting patients with the best chance of demonstrating a clinical effect,” said Rosa-Neto. The safety studies are expected to last about 3 months, and the initial efficacy study will last a little less than a year, he added. KalGene is now seeking global partnerships to take its Alzheimer’s disease therapy to the market. “We feel we have a very strong first drug candidate and hope we can have a real impact on treating Alzheimer’s disease. With our unique engineered molecules, we hope then to move onto other neurological targets and areas of unmet need,” said Gillard. 1. BrightFocus Foundation. Alzheimer’s disease: facts & figures. ww.brightfocus.org/alzheimers/article/heimers-disease-facts-figures (2018) .